Today was the final leg of our long journey to northern Japan. Our destination, Sapporo (札幌 = tag + Canopy, although it means “dry great river” and is pronounced "sat poro pet" in Ainu language), is located at 43 degrees latitude north and is both the capital and largest city in Hokkaido. Sapporo is quite a young city for Japanese standards and was founded only around 200 years ago when it had a little as seven people. These days around two million people live there making Sapporo the forth most populous city in Japan. Sapporo is located about 320km from Hakodate and the fastest train you can get between the cites takes three hours. The train that arrives the earliest takes a little bit longer leaving Hakodate at 07:04am and arriving in Sapporo 3.25 hours later at 10:18am. We reserved this train the night before after getting cheese cake for the second time. Since breakfast started at 6:30am we had to hurry to make sure we had enough time to catch it! We bought our luggage down with us, put it in a corner, gave our key back to reception and checked out of the hotel. That way we could leave as soon as we had finished breakfast. I can't remember too much about the actual breakfast except that I was feeling usually full and boiled eggs were somehow involved. After finishing breakfast we pulled our luggage to the railway station and hopped on our train. There were two places we were thinking about visiting along the way to Sapporo: Onuma Park and Noboribetsu. Noboribestu is a park is part of the Shikotsu-Toya National Park which features another two lakes which are both associated with volcanoes. Norboribestu is located about an hour from Sapporo by train and is famous for it's hot springs and "Hell Valley" which is an area of geothermal activity- similar to Osorezan. While we were more inclined to stop at Noboribetsu we were unsure if we would be able to store our luggage. We were able to find out that there were a small number of large enough lockers available although we were not sure if we would have time to utilise them, as the bus that would take us to the main area left very shortly after the train arrived at Noboribetsu station. Although we would not have to make any connections at Onuma park we were not sure if there were any lockers available at all. In the end though the day was rainy enough that we ultimately decided to stay on the train all the way to Sapporo and we actually ended up visiting Noboribetsu from Sapporo the next day. We got an alright look at the lakes and background volcano of Onuma park on the way through and arrived at Sapporo after our longest train trip so far. The first stop after getting off the train was our hotel in order to drop off the luggage. Since it was located to the north of the train station we knew we needed to go out of the north exit. When we got off the train we were a bit puzzled when found that the ticket gate exit were aligned east/west! Turned out that once you went out through the ticket gates you could then exit north or south. On the way out we had a look at a bakery just before the north exit doors. They had massive Hokkaido shaped bread which looked delicious! We took a bit of a scenic route the hotel by overshooting it a bit and walking too far north. For some reason we were expecting it to be not as good as the hotels we'd had so far. I don't know why but Kate had the impression that Best Western was a cheap version of the Westin. The fact that we had got it so cheap added to this impression. We were very pleasantly surprised when we found out that it was easily the fanciest we'd stayed at so far this trip! We asked to store our luggage and on the way out saw the daily weather report the hotel had displayed. It was a piece of cardboard and today had some clouds and rains drops on it, there was also the predicted high and low temperatures. They were in the range of 4-14*C. Cold! After exiting the hotel we made our way back to Sapporo station. First on our agenda was Moerenuma park! Moerenuma Park is a lark park designed by sculptor Isamu Noguchi and located on the outskirts of Sapporo. The park is noted for having a large number of large number of made features such strangely shaped hills, fountains and a giant glass pyramid. In order get to Moerenuma park using public transportation we first had to catch the subway to the bus interchange located at Kanjodori-higashi station from which we could catch a bus to the park. So after exiting the hotel, we made our way back to Sapporo station. While we were walking to the subway line (from the JR part of Sapporo station) we passed by a bunch of food shops and Kate purchased a cold bearded Santa Custard thing. It was the nicest custard thing she had ever eaten! It also came with a free block of ice- just like my cake in Hakodate. We used a ticket machine near the entrance to the subway to buy a Donichi Subway Ticket (ドニチカ = Do ni chi ka – ka is short for “Card”) each. This is special pass that gives you unlimited use of the subway lines for one day although it’s only available during weekends and public holidays. It costs 480円 return to Kanjodori-Higashi so the pass would pay off with just one more trip. You can also buy this pass during the week although at 800円 it’ll be a little harder to make it pay off. Donichi means weekend (ドニチ =土日 = Do + Nichi = Dirt + Sun) and the word comes from combining the kanji for Saturday (土曜日= DoYouBi= Dirt/Earth + day of week + day) and Sunday (日曜日= NichiYouBi = Sun + day of week + day). You can see in the word for Sunday that one of the kanji (日) is used to mean both day and sun and is pronounced differently within the same word. "Nichi" is an On Reading and "Bi" is a Kun Reading. Since this kanji is also used in the word for Japan 日本 (Sun + Source) it has also taken on Japan as a meaning. All of the days of the week are followed by the 曜日 which is pronounced “Youbi” and is equivalent to our "-day". As might be suspected from the identical meanings between English and Japanese for Sunday and Monday, the names of the different days of the week actually have a similar origin. In fact, they can be traced all the way back to ancient Mesopotamia and Egypt and are based on names for the sun, the moon and the visible planets. There’s lots more information on the history of the days of the week here. It’s quite an interesting read. Anyway! All I really wanted to say was that the Donichi pass is probably called something else during the weekdays. Sorry about the major digression! A short subway ride later we arrived at Kanjodori-Higashi and transferred to the attached bus interchange. After looking at the bus timetable it appeared that the bus would not be coming for a while. At this point we were getting a quite worried about the weather as although it was not actually raining the weather was looking pretty miserable. I checked the Japanese Meteorological Agency on my phone and we saw that it was due to start raining in under an hour! We had originally thought we would be okay but at this point conceded that it was actually terrible weather to go a park! We needed something that was indoors. After consulting the Japan Book we found that the Shiroi Koibito biscuit factory was the answer! Since it was located right at the end of the subway line we would also get good use out of our Donichi Card. Before leaving Kanjodori-Higashi we went across the road to a convenience store (I think it was a family mart) and asked about postage stamps. While they had some available they had no idea how much it would cost for international and since we had no idea either we left without any. We took the subway a couple of back stops back to Odori Station (where all three subway lines intersect) and transferred to the Tozai line. By the time we arrived at Miyanosawa Station it had started raining and in order to stay indoors for a long as possible we tried to exit through an attached shopping centre. Since we could not immediately find the exit we ended up going back into the station and going out through the regular exit. At some point my umbrella had broken and considering that it was a bit of a walk from the station to the cookie factory, I realised I had to buy a new one. There was a Lawsons just across the road where I spent 1000 yen on a black retractable umbrella. It was about twice as expensive as the clear folding umbrella I got in Sendai but it was small enough to fit in my backpack and I hoped that it would prove to be more durable. Now that I'm back home I can attest that it lasted the whole rest of the trip and I've been using it here in Brisbane. Those cheap clear ones are as flimsy as anything. We went through about 5 on our last trip! So be careful. I think we also got some food for lunch; I distinctly remember an egg sandwich. The walk to the cookie factory was about 600m and we got a little cold. Actually, once we found the factory we were so eager to go inside that we almost went in through the wrong entrance! We found the entrance to the tour and purchased a ticket each to the factory tour. They also had classes where you could make cookies and we were asked if we wanted to sign up to any and while we were tempted we decided not to as they all took a fair amount of time to do. With our ticket we also got a free Shiroi Koibito (白い恋人 = white + love + person = white lovers) biscuit each. 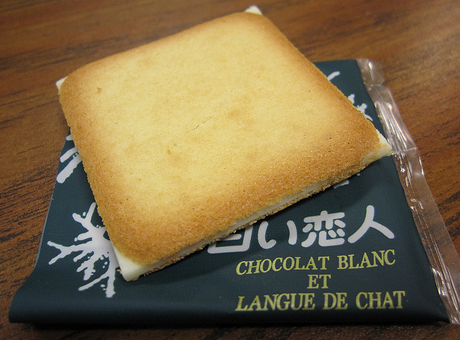 These are a kind of biscuit sandwich with white chocolate as the filling. They're very famous and you can see them for sale all over Hokkaido. We chomped them down and they were delicious! I think we should've appreciated them more though as I really wanted to eat one later when we were watching them being made at the factory floor display room. Before we got to that though we were treated with some displays on the history of chocolate and chocolate manufacture along with a room full of historic chocolate boxes from around the world. For some reason this was followed by a tea pot museum. Next came some displays detailing the process that goes into creating the white chocolate they use in the biscuits. I always thought that there was no cocoa at all in white chocolate but I learnt that although they remove the cocoa solids they still use the cocoa butter. Leading on from that explanation was the factory display floor where you could see the actual cookies being made! This was the best part of the whole tour! It was a little mesmerising watching the cookies being stamped onto the chocolate and we stayed to watch for quite a while. The different parts of the biscuit/chocolate were lifted up by little tubes that used air suction to hold them in place. Immediately after the biscuit and cookies were united the machine formed rows and rows of them which scrolled past a worker who the quality checker. This person removed cookies with obvious defects, such as breaks, deformities and misalignment. They also had a chart that would be occasionally referred to in order to check to level of brownness so as to ensure that the cookies were cooked just right. Sometimes multiple rows at once would have to be discarded due to some glitch causing multiple mistakes at once. What all this revealed to us was that a disturbing number of perfectly edible biscuits were being thrown away! It looked to be about 15% at least! Kate said she would like to eat the discarded ones and I agreed! Our hopes that we'd somehow be able to buy these rejects cheaply where dashed when someone came around to throw the bags of delicious discarded cookies in the bin. One thing that initially surprised me was the amount of people who were actually working in the factory. For some reason I had assumed that pretty much everything would be done by machines and people would only be required to make sure they don't break down. I wasn't sure if this was a just a Japan thing although they didn't look inefficient at all and no one was really doing anything a machine could do. After the quality check the cookies went for a brief trip through an oven which partially melts the chocolate and sticks the cookies together. Once the Shiroi Koibito were firmly joined it was time to put them in their plastic wrapping. The top and bottom bits of plastic were heat sealed together with a stampy kind of machine. Yet another machine was taking photos of the completed product- it looked like it was checking to make sure the wrapper was printed properly. Once we were finished watching the factory floor we continued on through to a café. They had a selection of parfait's and one was absolutely HUGE! I really wanted a smaller one but after much deliberation I decided to pass. We did see someone who was eating the massive parfait though! There was a western/Caucasian looking family and a young girl (looked about 8) was eating it. It was much bigger than her head! The rest of the tour was a little weird. There was an old vinyl records section and gramophone museum for reasons unknown. They even had a room dedicated to playing a record on an old gramophone every half an hour. It was packed with seats but there was no one in there- despite the fact that we passed by within minutes of it starting. Finally we passed through a large section that had hundreds and hundreds of old toys in display cases. At the end of the tour there was a shop and bought a packet of these hard little lollies. They're a bit like the Bo Beep sweets you could get from Daryl Lea although the Japanese ones both tastier and not as sticky. There was a glass window where you could actually see them making in the shop and I decided to buy them after trying a free sample they were also giving out. Right at the exit there was a little booth with a lady from Japan Post! We'd been looking for stamps ever since Aomori so this was a convenient surprise! They were even offering a free postcard of our choice to everyone who purchased a stamp. At the time we wondered how they could make money doing this but I later realised that most people would probably be buying lots of stamps in order to send the big boxes of biscuits and other treats that were for sale all over the shop. Since Kate hate two postcards to send we bought one each so we could get another two postcards for free. There were three to choose from and they all featured the Shiroi Koibito Park. Before leaving we had a little look outside in the courtyard and it looked quite nice but due to the rain we didn't spend much time exploring. I remember there was a hedge with a tunnel built into it leading to a hole where you could pop up and get a photo of yourself within the bush. On the way back to the station and while waiting to cross at traffic lights some young kids (around 9 years old?) on bikes talked to us. They talked in English though I replied in Japanese. They were saying something like "Candy please give to me". They could see it in my bag but as it was unopened I didn't give them any! When they rode off I heard one of them say "喋ったじゃない" = "(He) spoke (in Japanese) didn't he?" Since we still had some time left we thought we'd get off the subway at Odori Station and have a look at a few of the sights around there. Odori Station is named for Odori Park (大通公園 = oo doori kou en = big street public park), which is a large long park located right in the middle of Sapporo city. It runs west from the centre for about 1.5km and divides Sapporo into north and south districts. The park is actually made up of 13 different blocks which are separated by roads. 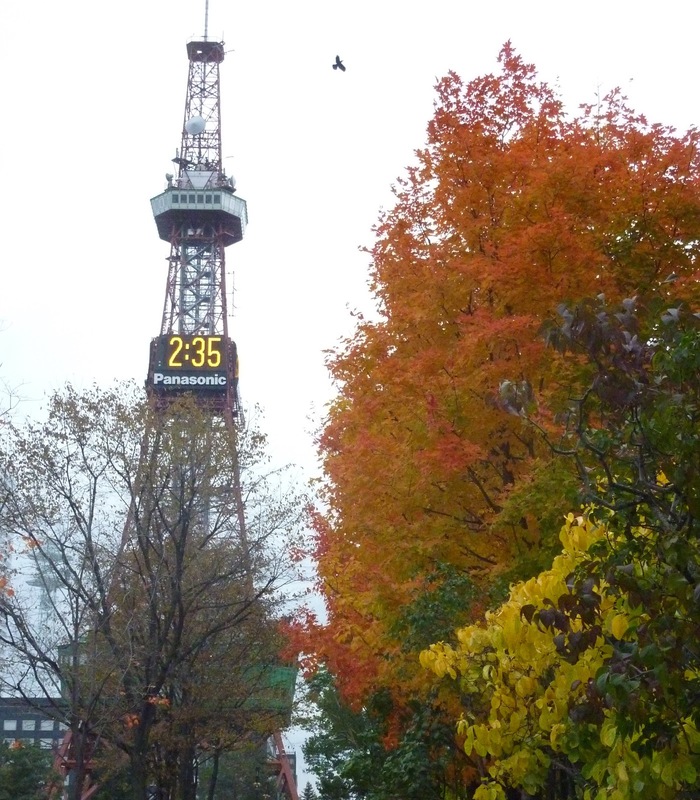 We decided to make our way to the Sapporo TV tower by walking along the park. The station is pretty close to the Tower so we only saw a little up close but it was still good! I remember there was one big fountain that was wetting a large non-fountain area due to the wind. If it wasn't so cold it might've been fun to run through it- although the source water in the fountain looked pretty slimy. While we were walking past some workers came along and actually climbed in and started cleaning out the slime! Once we got to the tower we bought a ticket (I think from a vending machine) and went up. The elevator was clear so we and it was splendid to be able to look out while we were going up! The tower itself was a bit old but the views of Sapporo and Odoiri in particular were fabulous. From the tower we could see a few of the other sights including Sapporo Station, the Nijo Market and, lurking in the distance, the 100th memorial tower. I tried to find the famous Sapporo Clock Tower but it must've been hidden by a taller building as I could not see it. After the TV tower we popped down to have a quick look at the Nijo Market before making our way back to the Sapporo clock tower. It looked a bit crowded so we didn't go in although we spent some time looking at it from the outside. There was a volunteer from the historic society whose duty it was to take photos for people. He offered to take ours and got a really good shot of us and the clock! As expected from an expert! While we were walking back to our hotel we passed by a loud protest. There were police at the beginning and end and the protesters were making a massive amount of noise. It was something about Korea I think although I could not understand what they were saying as the megaphones were distorting their speech. Despite all the noise there wasn't very many of them (around 20) and they were being ignored by everyone else. Apart from the demonstrators the walk back was uneventful. We passed through Sapporo Station, checked into our hotel and had a bit of rest. For dinner we returned to Sapporo Station and had a look at the Ramen Republic which is a themed area with lots of little shops selling different varieties of ramen. We decided against ramen though as I had it last night and Kate is not a huge fan. After deciding on one restaurant and then changing our minds because of cigarettes we ended up at another Otoya! I wasn't going to get the same meal again though! This time I had roast pork katsu and since I was worried about whether or not I was eating enough vegetables I also ordered a side of vegetables and chicken (tamanegi nashi de). All up it was a massive amount of food but it was delicious! I don't think I've had it before but I really liked the lotus root which is a kind of potatoish disk shaped vegetable with holes in it. My meal came to 1220円 this time. I think Kate got her cod and vegetables in black vinegar meal again and for desert some sort of Soy milk drink. After dinner we had an uneventful night at the hotel. The rooms were pretty large so it was nice to be able to spread out a bit. Tomorrow we're off to Noboribetsu! Nice - i really liked Sapporo. Re: Your pic saying it shows the Curb market - Curb market is nowhere near Ōdōri. We'll definitely give it a shot then- we might be going to Sapporo again this July/August! You're right, I confused the Curb Market with Nijo market! I've now corrected the post. Thank you very much for pointing it out! Is this your first trip and are you planning on seeing Kyoto/Tokyo? Nine days is a lot of time to just spend in either Sapporo or Toyama, so I'd assume you'd want to travel around to see different sights. If not Sapporo city definitely has far more things to see and do, Toyama city itself doesn't have a heap of tourism sights. The mountains in the distance are really nice to look at though. If your'e travelling around both are good options, Sapporo will let you explore places like Hakodate, Noboribetsu, Sapporo/Otaru, Furano and Asahikawa. Toyama is near the Japanese Alps where there are places like Kamikochi, Okuhida, Alpine Route, Kurobe Gorge, Takayama, Shirakawago. The last two places are good locations to see the traditional thatched houses. I haven't been to all these places and I've really enjoyed both of what I have seen, but if I had to make the choice I'd recommend the Japanese Alps area- the mountain scenery is really spectacular. The Takayama area is part of the extended “Golden Route” path that most first time travellers to Japan follow (Tokyo(kamkura/Nikko/Hakone), Kyoto/Osaka(Nara), Hiroshima(Miyajima), Takayma/Kanazawa/Shirakawago). The alpine route is also very popular and highly regarded. You could find a route to travel through and down to Osaka from Tokyo (and then shinkansen back)- though I'm not sure where you're coming from. I hope this helps somewhat! Wow that helps a lot! Thank you. This will be my fourth trip to Japan :) I have been to Tokyo, Osaka, Kyoto, Kobe and Himeji. Just can't get enough of Japan :) so this time I want to visit different scenery of city. Oh I thought if you go to Sapporo you will also see mountain scenery? I imagine both Sapporo and Toyama will be something like the Swiss Alps? It's like that isn't it! When we went for the first time I thought we wouldn't go back for ages but I've been at least one every year since! It's so much fun! The Japanese Alps around Toyama are like the Swiss Alps and I've travelled around that area a bit- They're really very pretty! Of course you will see Mountain scenery around Sapporo too, anywhere that isn't city is mountain. The mountains we saw from Toyama definitly stuck me as taller and pointier. I havn't actually done too much with the mountains around Sapporo although the trip up there and back we did was very enjoyable. One of the mountains we went up in a ropeway to get a good view of the city too. I definitely want to return one day and see more of northern Hokkaido too. Sapporo is definitely much more 'happening' city, Toyama is nothing compared to Sapporo. Toyama city is really just one of the medium sized cities on the west coast side of the Japanese Alps. You could have a good time in the area without ever visiting or staying in Toyama itself and not miss anything. Whatever you do decide just remember that you'll be back! A direct flight sounds good!